I recently added my O365 tenant, for testing purposes, to a AD FS in Windows Server 2016 TP4 and noticed something rather unusual. Via the AD FS Management snap-in it was not possible to assign an access-control policy in AD FS to my Office365 Relying Party (RP). Looking at my RP Trusts, I could see the Access Control Policy section was blank. Doing this on the O365 RP, only the Issuance Authorization Rules pipeline is visible, nothing else. If we compare that with a normal RP. Right-clicking and selecting access control policy, the administrator is presented with the option of choosing an appropriate policy for that RP: in our case, the desire to use multi-factor authentication. Why this does not appear on the O365 pipeline, I can only speculate. 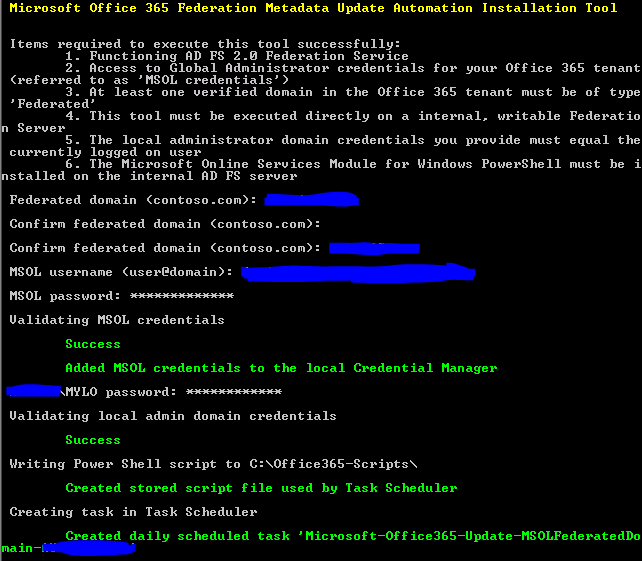 It might be partially explained by the fact that creating the Office 365 Identity Platform relying party is normally performed via PowerShell and Microsoft wanted to keep this procedure ubiquitous across all versions of AD FS since v2.0. 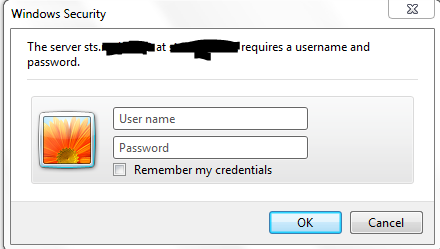 For example, the following command will create the Office 365 Identity Platform RP should it not exist. Alternatively, following the principle of Occam’s Razor, it could be Microsoft have simply not got round to updating their code to detect AD FS 2016 during O365 Relying Party creation Either way, from previous experiences of using MFA under Office 365 via AD FS 2012 R2, we do know it IS possible to use MFA with O365, so getting it working with AD FS 2016 just requires a little more effort. .. Looking at our O365 RP in PowerShell (Get-ADFSRelyingPartyTrust) , we see no access policies configured. Under the O365 Relying Party it’s blank. Since the UI doesn’t allow enabling MFA in an access policy for our O365 RP, playing around with PowerShell reveals that it is possible using the Set-ADFSRelyingPartyTrust cmdlet . Check the O365 relying party (Get-ADFSRelyingPartyTrust) that an Access Control Policy has been added. 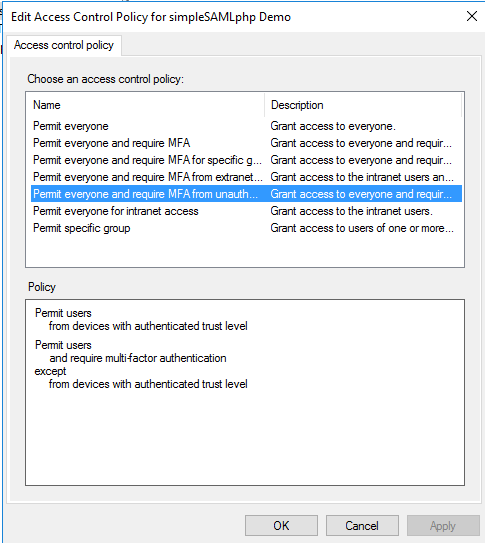 In the GUI, we then see the applied policy (Permit Everyone and require MFA) appearing. Another Powershell script from the ADFS team that makes life a little easier. When the token signing certificate of your home AD FS organization expires, then federation metadata between AD FS and Office 365 falls out of synch. Equally, when changes are made on the Office 365 that require updating the metadata, a similar issue arises. 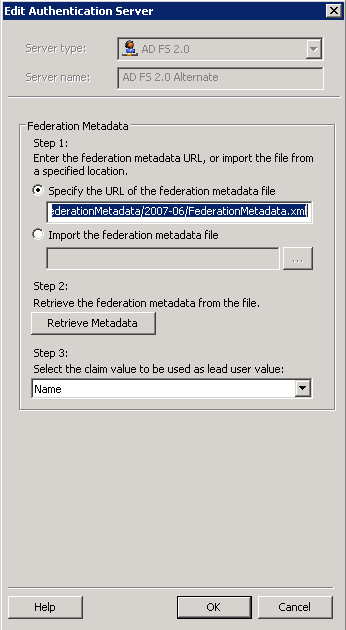 The script provide by the AD FS team checks the that federation metadata is validated regularly and any changes replicated between the two federating parties. On the AD side, a more suitable compromise may be found by using a least privilege account for the task service account. 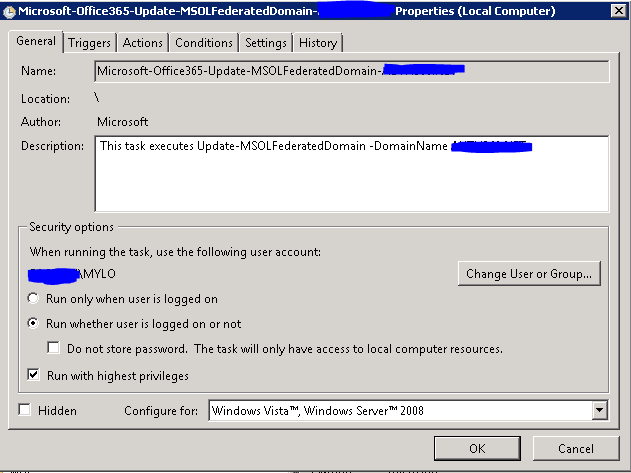 A while back (June 2011), I wrote a post on how to implement TMG, Single Sign-On (SSO) and strong authentication with Office 365. It was, as it turns out, an incomplete story. 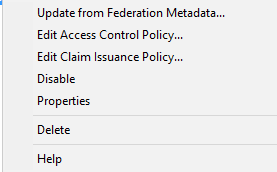 Those nice folks in the ADFS team have release a policy builder to simplify the creation of Client Access Policies for Office 365 in AD FS 2.0 Rollup 1 onwards. The above error surfaced recently when logging in at an O365 tenant. While the message itself is a fairly generic one, and can be attributed to a number of possible causes, in this case the organization (using identity federation) had an expired token signing certificate in their AD FS 2.0 configuration. They had automatic certificate rollover disabled on their AD FS farm so that AD FS could not rollover the configuration with new certificates. For some organizations, with web applications such as Sharepoint 2010, this may be a desirable configuration, with the process of certificate rollover being manually administered, rather than AD FS silently and automatically handling it. Hindsight is a wonderful thing in this case and paying heed to warning messages about expiring certificates in the event logs in the preceding weeks may well avert some nasty surprises. However, calamities happen and should this problem evade your radar in the future, looking at what recovery options are available may be useful. When the token signing certificate is due to expire (2-3 weeks before), the AD FS 2.0 Admin Event Log will begin to blurt out warning messages (Event ID:385). Token-signing certificate with thumbprint ‘4E8F5194309E48EDB7EF8440B47082FB3D1594B6’ is set to expire on 12/30/2011 1:00:00 AM. Token-signing certificate with thumbprint ‘4E8F5194309E48EDB7EF8440B47082FB3D1594B6’ expired on 12/30/2011 1:00:00 AM. An error occurred during an attempt to build the certificate chain for configuration certificate identified by thumbprint ‘4E8F5194309E48EDB7EF8440B47082FB3D1594B6’. Possible causes are that the certificate has been revoked or certificate is not within its validity period. MSIS2013: A required certificate is not within its validity period when verifying against the current system clock. Ensure that the certificate is valid and has not been revoked or expired. As the original title graphic intimated, federated logon at this point is not working. This meant that that once the signing token certificate expired, a replacement was not automatically assigned. In this case a new certificate needs to be provisioned manually. Of course, you could also elect to activate the autocertificaterollover function. Whether you elect to go the manual or the automatic route, in either case, you’ll still have some investigation to do. Before nuking your AD FS configuration, consider the impact of assigning / replacing the token signing/decryption certificates in AD FS. Who are the claims providers and relying parties involved? What application specific changes are required to support the certificate change? Of course, if you’re facing a production federation service outage then there’s likely to be other pressures to consider as well , but try and determine which relying parties or claims providers will be able to process the details of the change (automatically) via updated federation metadata exchange or not. In the case of the latter, some sort of manual intervention may be required. Applications, for example, such as Office 365 and Sharepoint 2010 will need to be informed of this change. 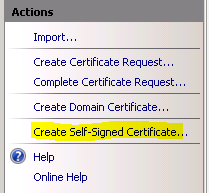 Give the certificate a recognizable “friendly” name and IIS creates the certificate. 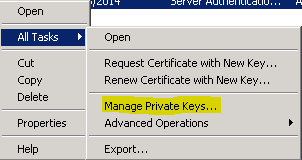 Select Manage Private Keys and give the AD FS service account Full Control to the certificate. Now you need to prepare to make the change. To trigger an automatic replacement of the existing certificates the following needs to be entered. BEWARE! By selecting the urgent option you are voluntarily hitting the self-destruct button and hosing any working configuration. Relying parties and claims providers will not have refreshed their federation metadata with you and at this stage will be working against stale metadata. It is best, therefore, to carry out these activities out out-of-hours and co-ordinate with the parties concerned refreshing of metadata. As I discuss later in this post, some parties need manual intervention. With the automatic rollover option selected, any existing token signing / decrypting certificates will be deprecated and replaced with a fresh one years’ validity alternate. In the examples below, I’ve used Office 365 and Sharepoint 2010 as two examples of web applications that need manual intervention. To rectify the problem of a token signing certificate change in Office 365, we need to update Online Services with new information concerning our certificate. As covered in the post here: https://blog.auth360.net/2011/10/15/ad-fs-2-0-rollup-i-multiple-issuer-support/ AD FS 2.0 now supports multiple UPN suffixes, so you’ll need to run this per UPN domain to update the respective information in Powershell. Substitute your own UPN suffixes with the examples above and the effect should be instantaneous and logon to MSOL possible once the update has been carried out. Run this through your test environment first to make sure you get the desired effect. An operation failed because the following certificate has validation errors:\n\nSubject Name: CN=ADFS Signing – sts.mydomain.com\nIssuer Name: CN=ADFS Signing – sts.mydomain.com\nThumbprint: 611CBD4AE55FE2F2C3F0648C16C57A231AA51491\n\nErrors:\n\n The root of the certificate chain is not a trusted root authority.. Registering the certificate as a root authority. 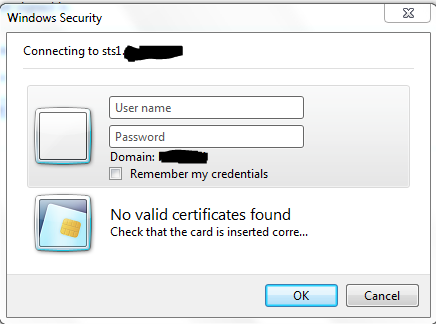 The certificate is self-signed and Sharepoint stores its own certificate trust hierarchy, outside of normal Windows conventions. This means that the self-signed certificate, effectively a root certificate, needs to be assigned as a Trusted Root Authority. Updating the existing trusted token issuer. This means replacing the existing trusted identity token issuer value for the signing certificate with the new one. The following Powershell script shows an example configuration. Your own configuration may vary and you’ll need to ensure that the identity to be updated is set correctly. As ever TEST, TEST, TEST!!!!….. As I mentioned in a previous post, earlier this month Microsoft released an update for AD FS 2.0 on 12th October. There are a few of us who have been waiting for client access policy support. Enterprise customers, in particular, will be a little happier with the options the enhancement offers. Client Access Policy support provides a means to restrict access by extranet clients to O365 resources. In particular, use of Outlook Anywhere outside of the organization can now be blocked, should your security policy require it and without this being at the expense of ActiveSync connectivity. "All client access policy scenarios have the effect of blocking external access to Microsoft Lync Online and Office Subscription Services." Additionally, this approach is geared around limiting the user rather than the device, so at this moment we still cannot handle managed/unmanaged clients. Nonetheless, far be it from me to begrudge progress … the fact that we are able to limit the use of rich clients such as Outlook to certain access conditions is good news. This claim is inserted by the AD FS Proxy, before passing the authentication request to the back-end AD FS server farm. 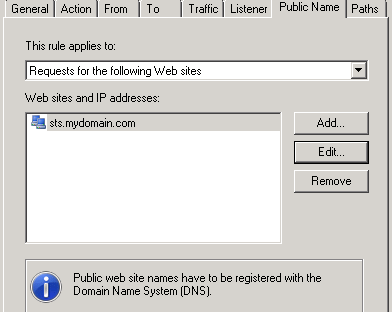 For example, the servername of the AD FS proxy proxy.mydomain.local will be inserted into the X-MS-Proxy caller identity. This claim is used for assisting in determining the IP address of the user, populated in the authentication request sent from Exchange Online, thereby allowing for limiting traffic to certain locations (e.g. corporate only). I’d suggest using some form of IP lookup tool to help determine where your IP/translation boundaries lie (this caught me when I discovered my “IP” was that of my upstream ISP). For example, use to lockdown external access to just Exchange ActiveSync. how this reacts to normal browser-based clients. you can always use Exchange ActiveSync device policies for soliciting access to mobile clients. Active clients are rich clients such as Outlook and ActiveSync. Since Lync isn’t part of Exchange Online, Lync clients will not pass an endpoint absolute path. You can paste the claim URL directly into claims rule itself as the document describes, but I decided that I might want to use these claims descriptions later, so for expediency I added them as claims descriptions for each of the five new claims identifiers described in the document. 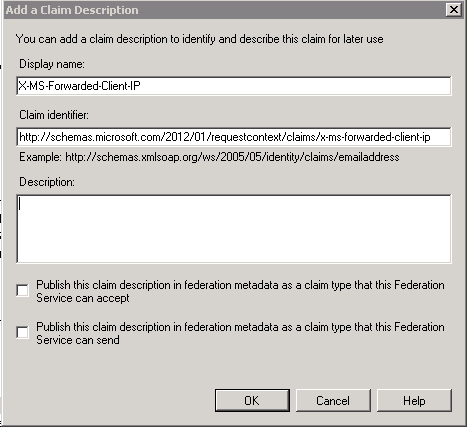 This can be accomplished through the AD FS 2.0 console under AD FS Service | Claims Descriptions using the Add a Claims Description option. Here’s an example for X-MS-Forwarded-Client-IP. On the relying party trust we create an Issuance Authorization Rule that is used to restrict actions based upon our specific requirements. In this case, the following limitation is to be applied. 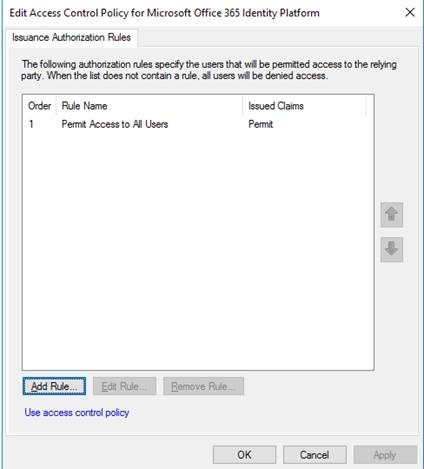 Allow access to users to the Office 365 based on a certain set of criteria defined in the issuance authorization rule. The interesting part of course is making all this work together: the various rule nuances/conditions and defining them according to the requirements of your organization. Let’s have a look…. In this test case, I wanted to deny Outlook Anywhere access to unauthorized users. Other functionality such as ActiveSync must continue to work, as must Outlook Web App and Sharepoint Online and Outlook Anywhere internally. 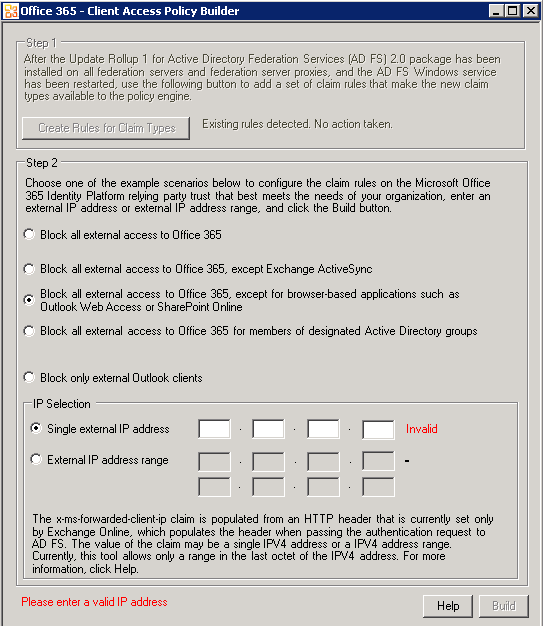 So, an Active Client (Rule 4:TRUE), using Outlook Anywhere (Rule 3:TRUE), not connected to the corporate network (Rule 2: TRUE), connects to Exchange Online from the Internet via the AD FS Proxy (Rule 1:TRUE) and if the (allowed) Group SID does not exist in the claim (Rule 5:TRUE) then the subject is DENIED access. So which is it? 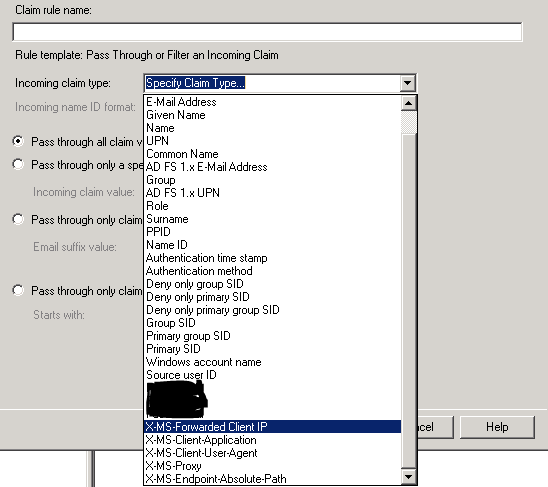 From testing, if the Group SID (allowed) exists in the claim, then the client will be allowed access. If the Group SID does “NOT EXIST” then they will be denied access (all other rules notwithstanding). What is not obvious from the above document is how one actually goes about setting up multiple domains. To work that one out you’ll need to read this post. In short, plan for this! The relying party for the Microsoft Online Identity Platform will need to be deleted, the federation trust for the existing AD FS realm updated with the –SupportMultipleDomain option, thus allowing support for (further) issuer/domain suffixes. Let’s have a look at some of the authentication methods/options that are possible with TMG, Federation and Office 365. I believe Microsoft at some point will expand on the supported TMG scenarios for O365 and how these options work in conjunction with AD FS 2.0. In the meantime, there are a few TMG front-end pre-authentication methods/combinations to try out with O365 and AD FS 2.0. As the diagram above illustrates, TMG supports a number of authentication types. 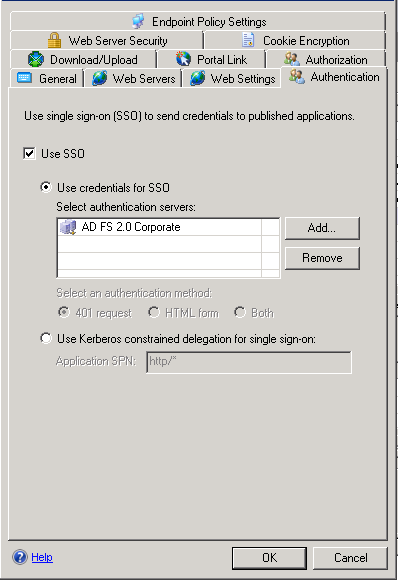 Let’s have a look at authentication combinations with TMG and AD FS 2.0 with the Office 365 suite as a relying party. The basic reverse proxy scenario, or No Authentication scenario as I’ll refer to it, is described here on the Office 365 community site. This is the only Microsoft-documented TMG configuration thus far for Office 365. The article provides an excellent starting point for configuring TMG with AD FS 2.0, so I’d recommend beginning with this configuration. 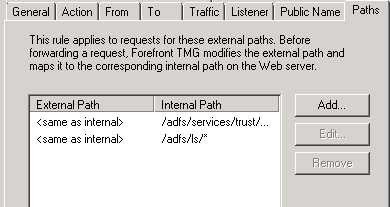 With no AD FS proxy present, the TMG is setup to reverse proxy traffic to the AD FS backend. 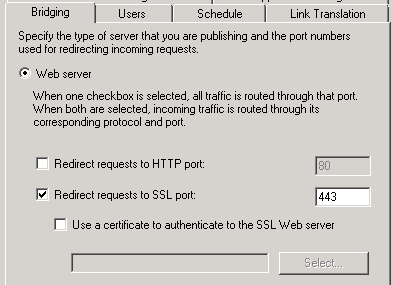 The user request is proxied to the AD FS server and the AD FS picks up the logon request. This scenario is called No Authentication as a reference to the fact that TMG isn’t performing any pre-authentication itself. It’s simple and doesn’t “interfere” with the federation logon process like the other approachesdescribed. It’s downside, one can argue, is that this approach may be less than satisfactory from a security perspective, with some form of pre-authentication at the edge more preferable. HTML Forms Authentication or Forms-based logon is likely familiar to most TMG administrators as it is often used in web publishing scenarios. 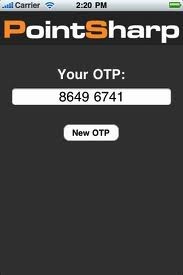 The use enters their credentials via a form; username/password, One-Time-Password etc. 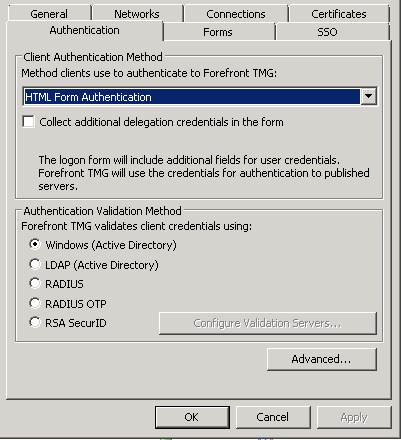 On the TMG-side, when configuring the web listener for HTML-Forms authentication, there are a number of authentication validation methods. In this case we’re interested in seeing what authentication options are possible with the Delegation tab on the publishing rule and which ones are available according to the authentication validation method selected. I didn’t have an RSA Authentication Manager/ACE server in my sandpit so was unable to test SecurID. 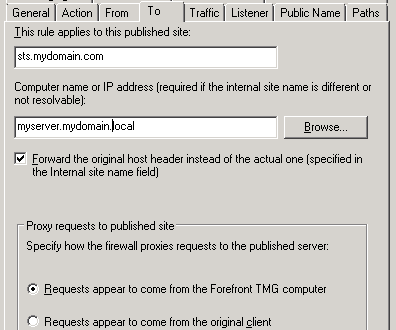 With HTTP Authentication configured on the TMG (AD FS) web listener , the user will receive a challenge prompt rather than a form when the Office 365 relying party redirects the user to AD FS through TMG. TMG then processes those logon details entered in the dialogue. Depending on the client authentication method we have selected (Basic, Digest or Integrated), there are typically fewer supported authentication validation methods against which credentials can be evaluated. From a delegation perspective, I used the HTTP Basic Authentication method on the TMG side. Results-wise, the majority of pre-authentication mechanisms involving TMG and various delegation scenarios worked. The same caveats concerning configuring web publishing rules, delegation etc. apply here. Changing the client authentication method to HTTP Integrated Authentication on TMG were unsuccessful (so far). HTTP Authentication with Digest was not tested. SSL Client Certificate Authentication is an interesting approach as it logs the user on using an X509 certificate. 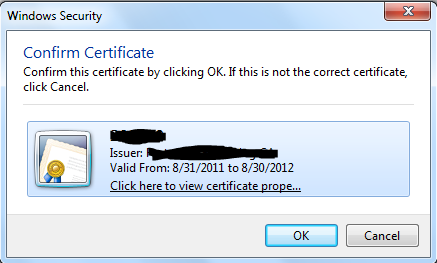 I issued my client (in this case my domain user account) with a client certificate from a local issuing CA. 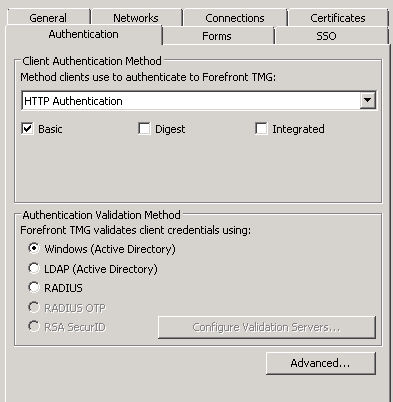 If the incoming connection does not possess a client certificate, then TMG can be configured to fallback to HTTP authentication, e.g. HTTP Basic. Once OWA had redirected the browser to TMG, a selection dialog requesting the client certificate for authentication was prompted. After processing the client certificate, logon was completed and access to OWA given. 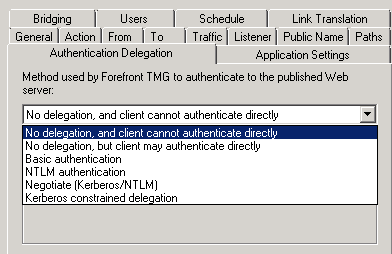 Note that Client Certificate Authentication only supports Kerberos Delegation as a delegation method. This approach deserves a little more attention and I’ll look at how this works in a future post. In particular, I’m curious how smart cards would work in this configuration and/or with the TLSClient option in the AD FS backend. On the TMG side, two publishing rules are required. 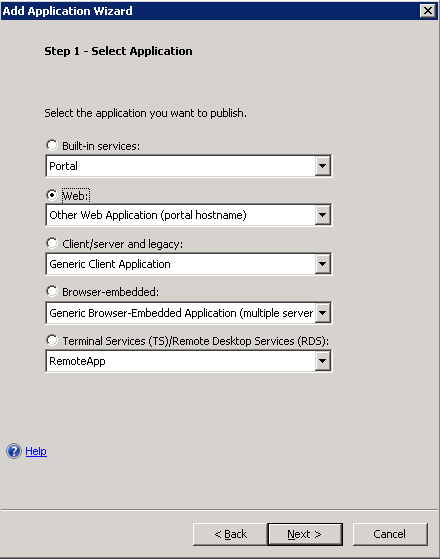 a web publishing rule for rich applications such as Outlook Anywhere, Lync Communicator Client and ActiveSync. that have special requirements. Attached are the relevant screenshots for the Office 365 web applications that will use TMG for pre-authentication (forms-based logon). The public name of the TMG matches that of the AD FS federation service and an (A) record is registered to the public IP of the TMG FBA listener. We also need to specify certain paths for TMG as pre-authentication scenarios require two publishing rules, with the public URL of the AD FS service being shared across the two rules. With forms logon example I’m using Kerberos Constrained Delegation. If Kerberos is to be used as the delegation method (recommended), ensure that the TMG computer account is trusted for delegation in AD Users and Computers, either for the AD FS server (single server scenario) or for the application pool (AD FS farm scenario). We’re bridging SSL traffic as AD FS is HTTPS only. 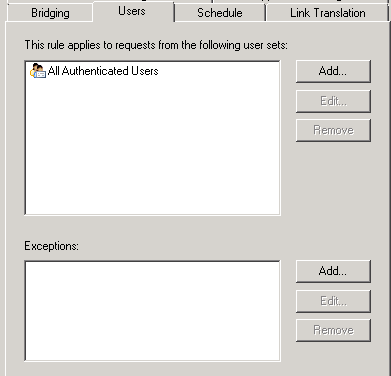 The built-in All Authenticated Users group should be used in this rule, contrasting with the All Users group mentioned later in the Outlook Anywhere / EAS / Lync configuration section. 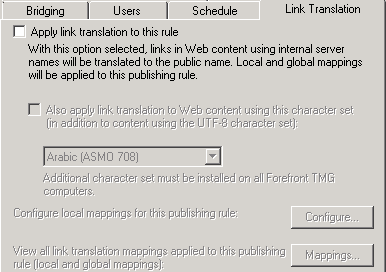 As the Office 365 wiki article mentions, AD FS 2.0 requires link translation to be disabled. HTTP Filtering will also need to be modified to ensure that Verify normalization and Block high bit characters are disabled. Let’s have a look at how TMG works for our non browser-based friends. As mentioned earlier, a second web publishing rule is required for certain “rich” clients. Active clients (Outlook/ActiveSync) and MEX clients in Microsoft speak, cannot be authenticated at the TMG. Instead, we must adopt the reverse proxy approach for selective paths to the AD FS service endpoints that can handle authentication of these clients. The Active client uses a password proxy-based mechanism where the Office 365 Exchange service will authenticate against Exchange services on behalf of the client using Basic Authentication. We can see the WS-Trust service endpoint used on the AD FS service handler. While this distinction is important in understanding how the client works, it makes no difference to TMG We use the same publishing rule, with anonymous access through TMG for Active/MEX clients and a connection proxied to AD FS where the actual authentication is processed. Again, I’ve attached screenshots and hopefully they’ll assist. 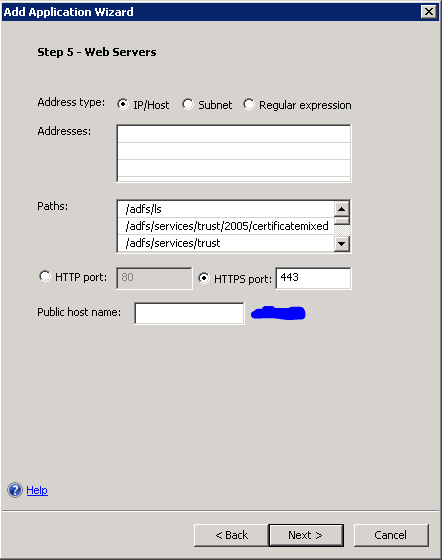 The paths field needs to contain the AD FS service endpoints that are used by the Outlook client (/adfs/services/trust/2005/usernamemixed/*) and Lync (/adfs/services/trust/2005/windowstransport/*). The Federation Metadata (/federationmetadata/2007-06/*) and MEX endpoints (/adfs/services/trust/mex*) are optional (I use them for testing the publishing rule). UPDATE: 05/09 – /adfs/services/trust/mex needs to stay in the web publishing rules otherwise connection problems may arise. The clients communicate directly with the AD FS endpoints, so no pre-authentication via TMG is possible. 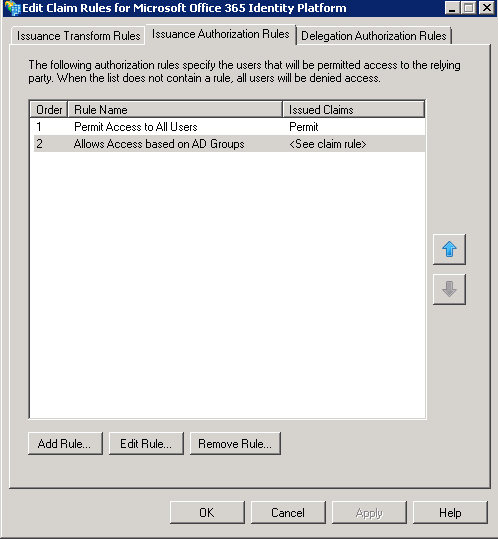 With the absence of authentication on the listener for the above paths, the All Users user set should be used rather than the All Authenticated Users user set seen in the previous rule. I always finish these posts thinking I’ve forgotten something … I did find this Technet article a useful reference. A word of caution, aside from the usual test test test waiver I throw in, it’s important that you think of the use cases under which you intend to deploy this type of configuration. If there are other relying parties that are in use behind AD FS 2.0 then it will serve you well to test integration-wise whether these are affected. TMG is not federation-aware and we animate the logon process to federation services through credential delegation. While this works well enough in this scenario, TMG is effectively becoming the Internet proxy for AD FS activity. Share your experiences and have fun testing! 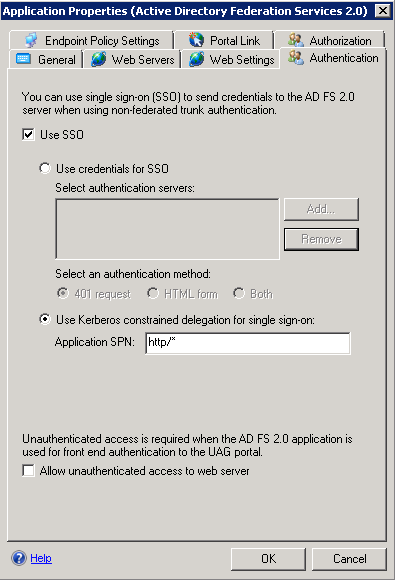 I wrote in previous posts about some of the more unusual access scenarios involving Office 365 and UAG with AD FS 2.0. 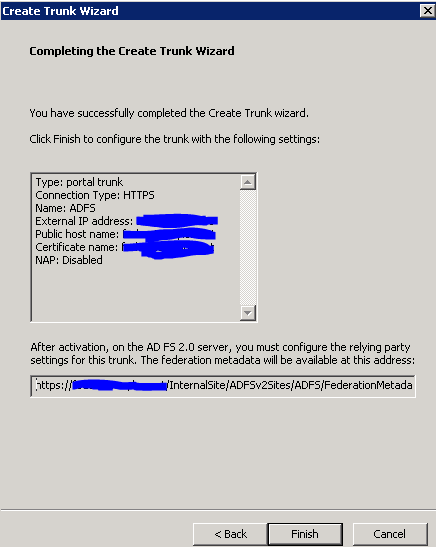 In doing so I’d not gone through and covered setting up a basic federated trunk scenario using UAG, AD FS 2.0 and Office 365. With this post I’ll attempt to remedy that. In a normal O365 federated identity setup, UAG would be configured as a relying party to provide single sign-on to web applications at the edge. As a relying party UAG then processes security tokens issued by the AD FS security token service. For UAG admins, there is a key difference in the way UAG works with AD FS compared to other authentication services. Normally speaking, it is the UAG that is directly responsible for front-end authentication. Here, however, UAG adopts the role of an AD FS proxy and uses the AD FS infrastructure to provide the authentication and process the requisite claims required for single sign on to back end web applications. There is no authentication taking place on the UAG. This is borne out when we look at the web application configuration the for the trunk, with UAG configured like any other claims-aware application or relying party. Additional authentication services cannot be used on the same trunk. Also, unlike the AD FS proxy, UAG does not provide a forms-based logon page. Instead it uses challenge/response. So a user who is accessing O365 from a non-domain joined machine can expect to an NTLM challenge response. 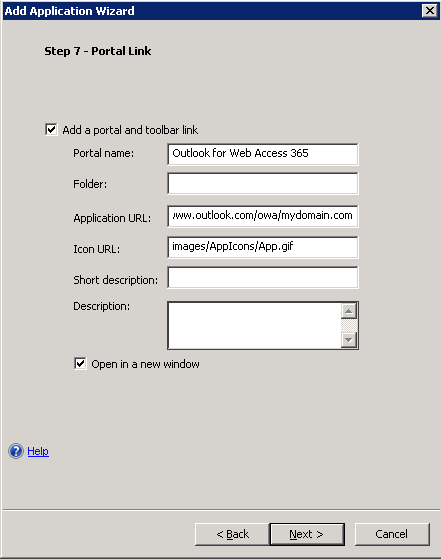 Connecting to an Office 365 web resource from the Internet with a domain joined machine on the Internet, users can logon via IWA and get the single sign-on experience to the O365 resource when the STS is in the Local Intranet zone of the browser. Looking at Fiddler, one can see a kerberos service ticket in the negotiate header. No Proxy-Authorization Header is present. 30 82 06 28 A0 30 30 2E 06 09 2A 86 48 82 F7 12 0‚. ( 00…*†H‚÷. From a non-domain joined machine, the fact that we’re doing IWA and and Negotiate means that it falls-back to NTLM (and the logon challenge/response)…..
96 00 00 00 60 01 60 01 AE 00 00 00 00 00 00 00 –…`.`.®……. Office 365 SSO and AD FS 2.0 Namespaces: There can be only one…..
“Active Directory Federation Services only allows for one namespace per farm/instance”. I’ve been using two ADFS instances in the back-end, testing various combinations using the mythical sts.mydomain.com and sts1.mydomain.com endpoints. The AD FS authentication server ‘AD FS 2.0 …" is used in more than one trunk: TrunkA, TrunkB. 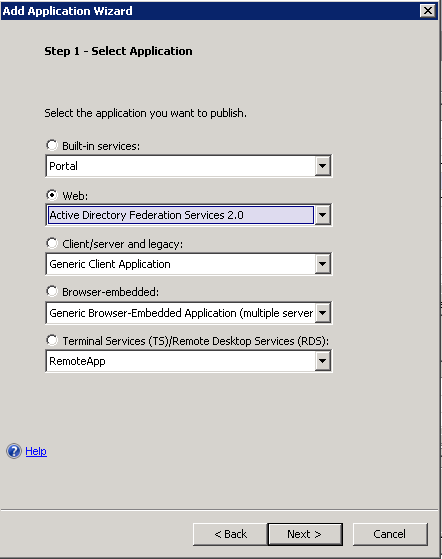 Configure the UAG to use the AD FS 2.0 authentication server in one trunk only. In the previous post I looked at configuring TMG to allow it to support both strong authentication of Office 365 (passive) web clients and at the time act as a reverse proxy for rich/active clients that use classical username/password for authentication. Attached is a diagram highlighting the high-level communication flows associated with the previous post. I’ve emphasised the HTTPS traffic between the Federation Gateway and TMG for rich/active clients (the thick arrow), as it’s bi-directional in nature. Unlike the passive client where all communication occurs through HTTP redirects, rich/active clients bounce around from server to server. This makes building a solution that supports multiple (strong/weak) authentication schemes difficult to implement and why, in the long term, customisation of the AD FS proxy pages may be the easiest route. 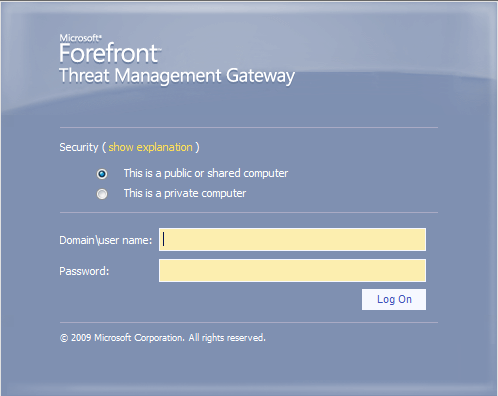 This post looks at how TMG 2010 may occupy a role of hybrid AD FS Proxy for Office 365. In previous posts on this blog we looked at using TMG as an AD FS 2.0 proxy .. When testing this back in Q4 2010, there was some uncertainty when testing (at least on my part), as to whether TMG as an AD FS proxy replacement was actually a supported configuration. Happily, it looks like these questions have been answered. In TechEd in Atlanta, the Office 365 deck on Identity and Access Solutions (OSP215) describes TMG as an alternative proxy offering for Office 365. Inside the organisation, passive clients make use of the local AD FS 2.0 instance (rather than TMG), whereas Rich/Active clients use a more complex process . In fact, the latter makes for an interesting challenge, for any would-be admin, as the Microsoft Federation Gateway needs to call-back to the on-premise AD FS instance. Normally speaking, active and rich clients must, therefore, go through the AD FS Proxy for logon. In this post, we substitute the AD FS Proxy role for TMG, so that we may leverage capability that TMG can offer (I’m using the example of strong authentication). Create a web publishing rule that triggers authentication (two-factor) on the TMG front-end and then uses delegation to the AD FS back-end using Negotiate authentication. We are then able to support access requirements for both two-factor (external) logon from the browser, whilst also supporting the ability of single factor logon for active/rich clients, domain-joined and non-domain joined…….. There are a couple of tweaks in the TMG configuration necessary to ensure compatibility with AD FS 2.0…..
Rule #2 applies for the rich/MEX and Active client profiles for Lync and ActiveSync/Outlook respectively. The more restrictive rule (two-factor) should be applied first in the firewall list. As a general rule of thumb, let the TMG Logs and Reports tracker, together with Fiddler, help debug any protocol issues that may arise. Next stop ….. UAG !!!! Option 3 is very much possible if you’re prepared to roll up your sleeves and do some sort of customization of the ADFS Proxy sign-in pages to support 2FA, with your strong authentication vendor of choice. I’d expect to see some sort of progress from MS on this, given that Office 365 launches this month. Getting this working through TMG was really the motivation for me here. 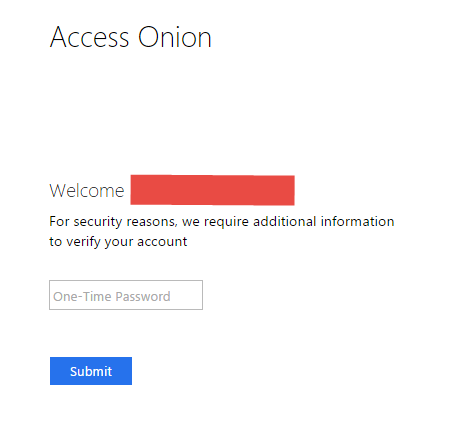 If, as a prospective Office 365 customer, you have a requirement for strong authentication for external users, whilst at the same time you need to support traditional username/password logon internally, then maybe this option can assist..… as ever, your mileage may vary and please don’t deploy before testing this to death in anything close to production!